The free, invitation-only app for iOS and Android may make it easier to meet up with your friends IRL. Between Buzz and Google+, Google hasn’t exactly had the best of luck with its social media efforts. 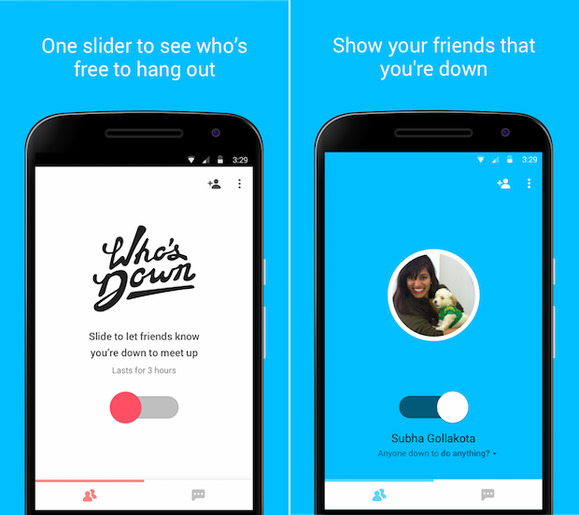 But with Who’s Down?, a new app and service the company is testing, Google’s looking to help you connect with your friends in the meatspace instead of cyberspace. The idea behind the app is simple enough: Toggle an onscreen slider to show you’re available to do something, specify what you’d like to do (go get lunch, go bowling, whatever), and see if any of your friends are free to get together. From there, you can chat with your friends and set something up. At first glance, Who’s Down? seems like a take-off of Apple’s Find My Friends app, but it’s really quite different. Find My Friends will let you track where your friends or family members are, but Who’s Down? is all about tracking availability. In that respect, it’s more akin to a simplified calendar app with a chat feature mixed in. Who’s Down? is a free app for Android and iOS, but you’ll need to request an invitation from within the app in order to use it. We haven’t tried the app just yet, but it’s clearly the sort of app you’ll need most of your friends to use in order for it to be truly useful. This story, "'Who's Down?' is Google's new app for meeting up with your friends" was originally published by Greenbot.